Master of the comic memoir and frequent NPR contributor, David Sedaris returns to Quail Ridge with the paperback of his When You Are Engulfed in Flames. David will begin booksigning on Wednesday, June 24, at 4:00 pm. He will stop at 6:00 pm for his not-to-be-missed program. At the conclusion of his program, he’ll go back to signing. 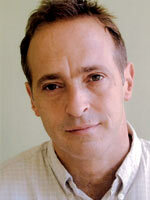 This is a signing line ticket event; receive a ticket for the signing line with the purchase of any David Sedaris book. As always, David will deliver an intelligent take on the banalities of an absurd life.